Founded in 2006, nonprofit organization Charity: Water is on a mission to bring clean drinking water to everyone on Earth­. To date, the organization has funded almost 19,000 water projects in 24 countries. Administrative expenses are covered by private donors, foundations and sponsors, leaving 100 percent of public donations to directly fund water projects. But the company's approach to radical financial transparency doesn't mean that its offices are shabbily outfitted. "The only way we could have a space like this in New York City is because a lot of generous vendors and individuals were integral in making it happen," said office manager Jordan Hunter. Chief of staff Lauren Letta added, "It's important that our physical space represents our mission, with beautiful inspiring photos celebrating the people we serve, and monitors with real-time data to show the impact of our work." 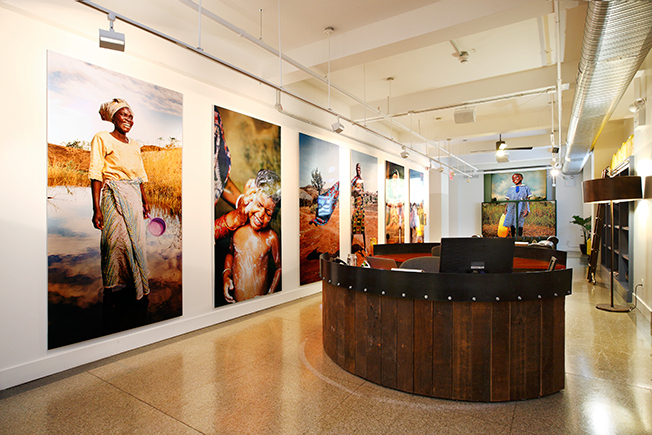 The bookshelf in the reception area is topped by jerrycans, the brand’s symbol since its founding. “They symbolize the harsh reality of the water crisis and what a huge struggle it is for those without clean water, as a full jerrycan can weigh more than 40 pounds,” explained Hunter. #Nothingiscrazy was the slogan for the 2015 campaign, which highlighted some of the craziest things supporters have done to raise money, like running marathons in their underwear, shaving their heads and riding bikes across the country. The open office space is home to 78 employees and about a dozen interns. The rustic aesthetic keeps the vibe casual and warm, but also fosters a collaborative and functional environment.